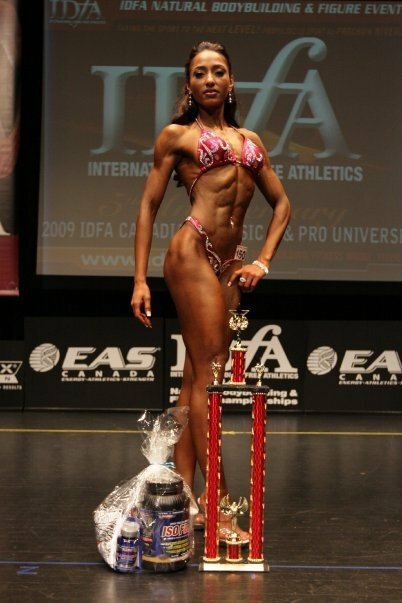 Kailash Persaud Shed 62 Pounds And Stepped On Stage At Her First Figure Competition! Kailash had always been interested in sports, but it wasn't until she decided to compete that she understood the importance of proper nutrition. Read on to learn how she shed 62 pounds right here! 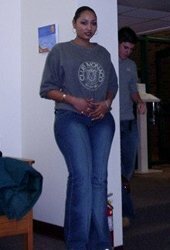 Despite coming from a family that rewarded excellence with sweets and sickness or disappointment with "cheer me up" dinners, at 180 pounds, wearing size 13 jeans, I couldn't understand why I was so heavy. I always attributed it to my genetics and my ethnicity. I was involved in sports: basketball, cricket, squash, badminton, martial arts…yet the weight would not come off. Shopping for clothes was a chore and I even remember times where I'd stand in the change room crying because the biggest size pants the store carried would not fit me. I am a born Canadian, but was raised for the major part of my life in Trinidad in the Caribbean, with warm sunshine and white sandy beaches, and up till the age of 24, I had never worn a bikini, it was always shorts and a T-shirt. I was ready to try anything (including those shock therapy belts to stimulate fat loss - ouch!). Through a mountain of trial and error, weight fluctuations, frustration, hard work and sweat, dedication and tears, I finally realized my goals and surpassed my own expectations. I am thoroughly thrilled and excited for future prospects. I Couldn't Understand Why I Was So Heavy. 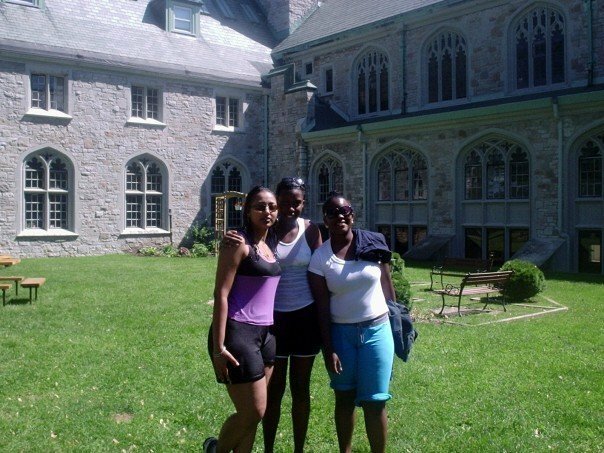 At age 18 I left Trinidad to come to Canada to complete my tertiary level of education. During this time I had ballooned up to 190 pounds. I finally decided to join a gym, at age 21, where I'd see the majority of "skinny" women tearing away at the cardio equipment (especially the treadmills), so logically I came to the conclusion that cardio (and cardio alone) = beautiful, lean, toned body. A large part of this was also due to my ignorance in the field of health and fitness. I did lose some serious weight through cardio alone, but it wasn't long before my weight loss plateaued and I still didn't have that tight body I craved. I started doing my own research into workout plans for weight loss and "toning" ... Lo and behold, just about every site I logged onto mentioned some form of weight training to aid in attaining my health and fitness goals. Bodybuilding.com became my homepage and my fitness bible. Through further research and reading, I came across the physiques of women such as Pauline Nordin, Gina Aliotti and Monica Brant and I was blown away! I fell in love with their strong, contoured definition and poise. Their curves were accentuated with curves and their faces were beautiful and radiated confidence. That was what I wanted my physique to look like and to look like that I would have to adapt an intensive weight training routine. I finally discovered the glorious feel of cold iron in the palm of my hand. Of Cold Iron In The Palm Of My Hand. I felt powerful and I felt like I was defying the gender boundaries set by society when I walked into that testosterone-filled weight room. I took the initiative to educate myself and look up the proper form for various exercises and specific exercises to work different muscle groups. At age 23, 150 pounds, and seeing glimpses of my abs for the first time, I decided that I was going to compete in my first figure competition. It didn't exactly happen in the moment I made the decision, since I needed more time to fine tune my physique and lose some more weight and do more research on the investments involved in becoming a figure athlete. I attended various bodybuilding and figure shows and started networking within the industry. In March of 2009, at 145 pounds, I committed myself to entering my first show, after the Canadian bodybuilding icon, and the current love of my life, Renaldo Gairy, assured me, via my BodySpace profile on Bodybuilding.com, that my physique was well worth showing off on stage and quit procrastinating with realizing my dreams and my potential. My show was set for November 7, 2009 (a week before my birthday). I attended various posing workshops and fitness shows throughout the year, was doing my own training and dieting and finally recruited the help of nutritionist, Tamara Vahn, online after I realized I needed an intensive, structured diet plan to cut up for the competition. My biggest problem from the start was my diet, and I didn't realize until that moment just how important a factor it is in weight loss and muscle gain. I am proud to say I ended up winning the Figure Tall division and the Overall title. Plan To Cut Up For The Competition. The experience has been so surreal and exciting. My total physique has been transformed because of it. It's like I'm the artist and my body is the clay that I can contour and shape to my own desire. The last time I was 128 pounds was probably before my teenage years. I had many wonderful people supporting and backing me throughout my long, tedious journey, all of who I'd like to thank: my proud and supportive family, my friends from Canada and Trinidad, my comrades at the gym and the Goodlife staff, my lovely boyfriend, and my many acquaintances on BodySpace. It's been a humbling experience in that when you think you know it all, there's always something more to learn; your work as an artist is never done as there is always room for improvement. My new goal is to motivate other women to achieve their own health and fitness goals, and, to become a fitness icon that especially other Indian women can relate to and become inspired by. I plan to compete in three or more events next year and pack on 5 pounds of muscle before then - I can't wait! As There Is Always Room For Improvement. My diet depended on my physique each week and did involve some carb cycling. However, a typical week would be as follows, where I'd interchange between these two meal days for 8 days. Again, my training depended on how I was feeling, my energy levels, my allowed time, diet and mostly, what I felt my physique needed. I cannot stress enough how important research is in your quest to maintain a fit and healthy lifestyle. Science and technology are constantly changing; don't take the word of one person to be gospel. Do some research and form your own opinion. A lot of the things we learn are through trial and error. What works for one person may not necessarily work for you. There are millions of people on the same quest that you are; if they can achieve their personal goals so can you. You are defined by the limitation you place on yourself. Keep pushing through; when you cheat, you're only cheating yourself. If you don't have a BodySpace profile, I suggest you do start one. It is a fantastic way of gauging your progress and getting constructive feedback, advice and support. And finally, enjoy everything you do, if you don't have a certain love or passion for it, then most likely you are not going to succeed or it may be a temporary success. All the best with your health and fitness endeavors!